The United States accuses the Al-Qaeda-affiliate Al-Nusra Front of detaining 43 members of the UN peacekeeping force in the Golan Heights. 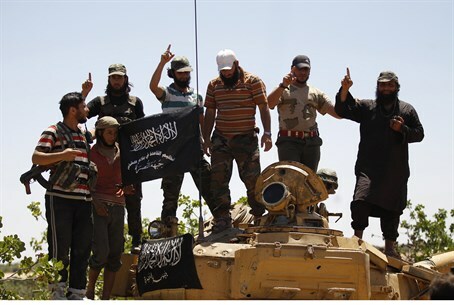 The United States on Thursday accused the Syrian Al-Qaeda-affiliate Al-Nusra Front of detaining 43 members of a United Nations peacekeeping force in the Golan Heights, near Syria's border with Israel. "The United States strongly condemns the detention of UN peacekeepers and ongoing violence targeting the UN Disengagement Observer Force (UNDOF) in the Golan Heights by non-state armed groups, including UN Security Council-designated terrorist group Al-Nusra Front," U.S. State Department spokeswoman Jen Psaki said in a statement quoted by AFP. Washington demanded the "unconditional and immediate release" of the "blue helmets" after the armed groups forced the peacekeepers, from Fiji, to disarm and then took them hostage near Quneitra crossing. Syrian rebels, including Al-Nusra Front fighters, stormed the crossing on Wednesday, sparking an exchange of gunfire with Israeli troops. 81 Filipino peacekeepers refused the rebels' order to disarm, and they were locked in a standoff, UN and Filipino defense department officials said, according to AFP. The UN Security Council also strongly condemned the abduction and called for the unconditional release of the Fijian peacekeepers. A UN spokesman earlier said it was unclear which group had staged the attack. Over the past year, the UNDOF force has had its peacekeepers seized by armed groups, its observation posts attacked and looted, and its freedom of movement curtailed. The Golan Heights has been tense since the start of the civil war in Syria, and the fighting in Syria has more than once spilled over to the Israeli side of the Golan Heights. On Wednesday morning, six mortar shells careened into Israeli territory from the Quneitra area, lightly-to-moderately wounding an IDF officer and causing damage to several vehicles. In response to the mortar shells, IDF artillery fired at a Syrian military position. Later in the day, one Israeli was lightly wounded by tank fire in the area, after a possibly errant shell struck an Israeli community in the region. Senior IDF sources appraised on Thursday that Syrian President Bashar Al-Assad's forces would attack the Syrian side of the Golan Heights over the course of the night, after the Quneitra border crossing to Israel on that side was captured by rebel forces. Similar attacks also took place on Wednesday night.